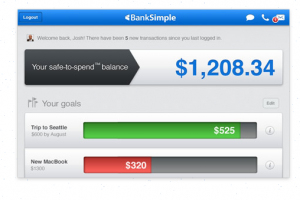 BankSimple, the next generation mobile bank start-up, has raised $10 million as it prepares to launch. The new financing is led by existing investor IA Ventures and also includes Shasta Ventures and should help the company scale up for a public debut later this year. The New York City-based company, founded by CEO Josh Reich, announced it will be partnering with Visa (s v) for its banking cards and will holding its customer deposits at The Bancorp Bank and CBW Bank, which are both FDIC-insured. BankSimple, which I profiled earlier this year, is actually not a bank but will leverage partnerships with BanCorp and CBW to offer a very modern banking service that allows users to combine all their credit, savings, checking and termed accounts into one banking card. BankSimple will use machine learning and statistical analysis to manage users’ money, help them reach their stated savings goals, and stay within their spending limits. The service, which tries to add more transparency to the banking process and eliminate surprise fees, also leans heavily on smartphones, with which BankSimple users can deposit checks or monitor their funds. The phone’s location will also be used to help combat fraud. For now, BankSimple said it will widening its trials and is expanding to friends and family. Take a look at a video interview I did with Reich.